Remember how I was bragging on my students for bringing in recipes that included a new fruit or vegetable they had tried for a class project? Well, this recipe was one of them. 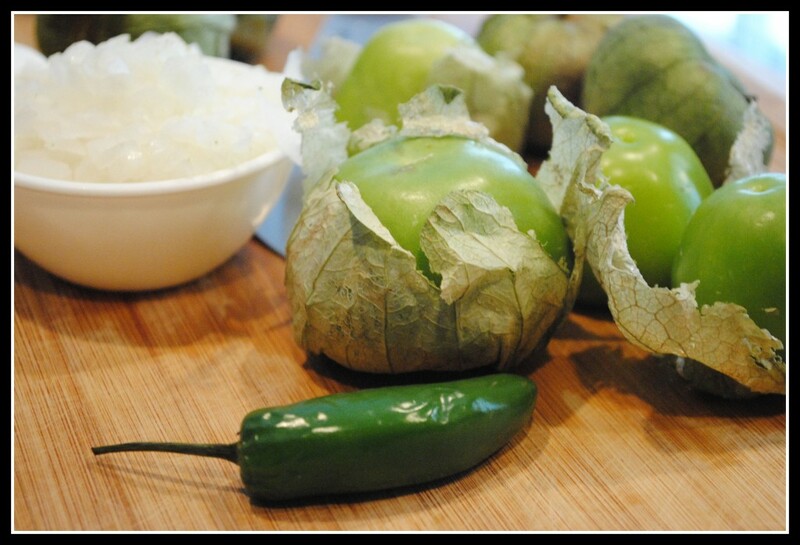 While I have had tomatillos before, I had never made tomatillo salsa. The recipe my student brought in was fabulous, and ironically, I needed a salsa verde for Sunday evening’s recipe. After a quick Google search, I found the exact recipe on allrecipes.com. Place tomatillos, onion, garlic, and serrano in a sauce pan and pour water over the top. Bring to a boil over medium-high heat and season with cilantro, oregano, cumin, and salt. Reduce heat to simmer for 10-15 minutes or until tomatillos soften and the skins begin to turn yellow. 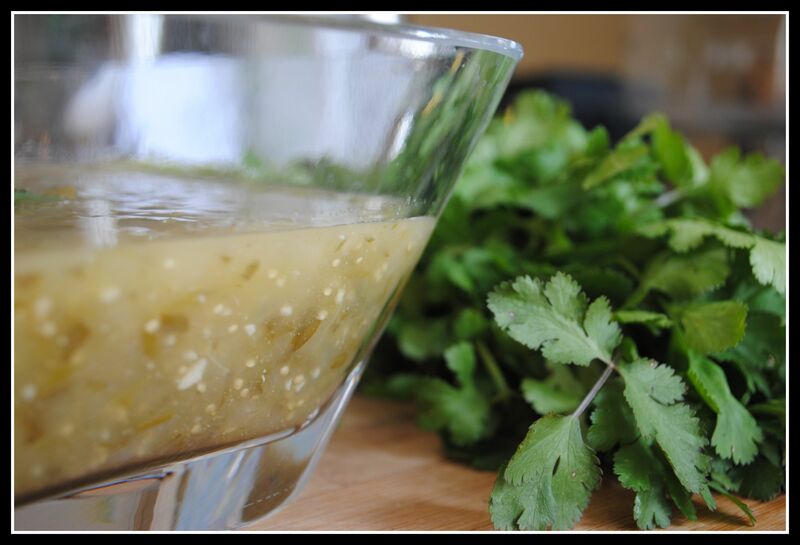 Transfer tomatillos and ingredients to a blender and puree to desired thickness. Yield: 2 cups total (8 servings – 1/4 cup each). Result: Spicy!! This is a delicious change of pace from the baja fresh salsa and garden fresh pico de gallo I usually make. Seeing as we like some heat in our cuisine, this was a hit! It comes together very quickly and stores well in the fridge, allowing the flavors to thoroughly develop. Tomatillos are available at most local grocers for about $2/lb and are therefore comparable to the price of tomatoes at this time of year. Enjoy! Mondays and Wednesdays are crazy for me, so I have breakfast made for the week — oatmeal or turkey sausages, and have leftovers ready for dinner tonight. I was more active in the kitchen on Saturday than I normally am, but I hadn’t finalized the menu for the week until Sunday…sorry! And I upheld my workout plans for the week: 3 mile run and 20 minutes on the elliptical on Thursday, 60 minute elliptical workout on Friday, a 4-mile run on Saturday, and a hockey game last night. Today is a rest day! Good thing seeing as I was still on the ice at nearly 11pm last night! Question: Green or red salsa? Mild, medium, or hot? Yum! I’m so glad you posted this today. Perfect timing. I bought a pound of tomatillas and we are having a pork dish with them but this salsa will be a perfect side. It sounds delicious! I’ve never had tomatillos! I need to change that! Great job on your workouts, Nicole! And your menu this week sounds YUM! You’re so good about menu planning. I do my menu planning the night of the meal. ha! 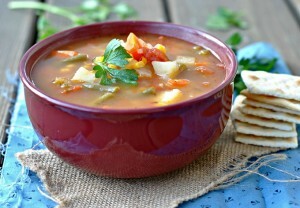 Mmm….this looks great, glad you posted it-and love how you got the recipe idea!!! Wow those looks so great! I’ve never tried tomatillo before. Your salsa looks really great. I made salsa verde once and remember not being a fan. I am a red SPICY salsa fan, the spicier the better! I always ate red salsa growing up (I like my salsa HOT) but now I much prefer green. I like how it’s so tangy. So awesome that you got a good recipe from a student. I like red salsa and I like it medium. I love salsa verde – I would put it on everything if I could. Red salsa is good too, but I eat it more often so its not quite as exciting. I’ve never had green salsa, but I love hot red salsa! I’m a spicy red salsa girl myself (that sounded bad..) I have bookmarked this recipe though, and when I see tomatillos I’m going to give this a try. Have a great week Nicole!!! I am definitely a green gal…especially for enchiladas. That salsa look amazing! I am going to have to make that. I think that was a great project you had the students do! I’m weak, I’ll take mild for sure! I love red salsa but love green enchilada sauce even more. I’d have to kick the heat down a knotch for me, but my husband would probably love this as is for him! 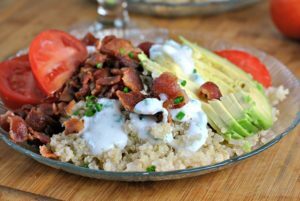 oh this looks great and so full of flavor!